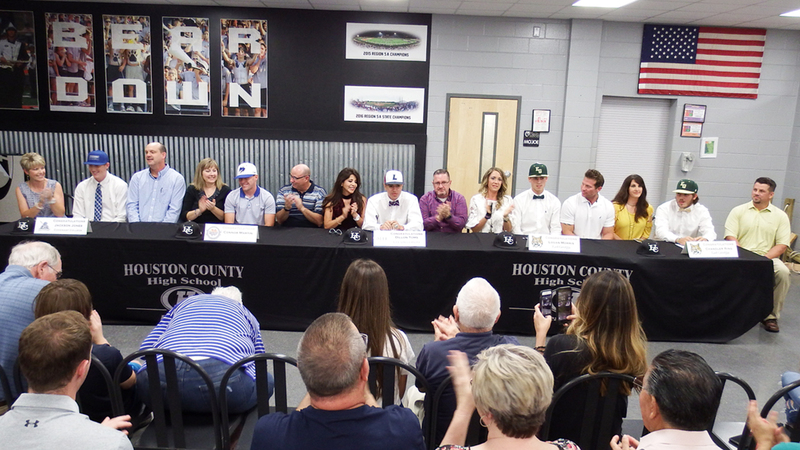 Houston County High had five of its baseball players sign college scholarships recently at the school. 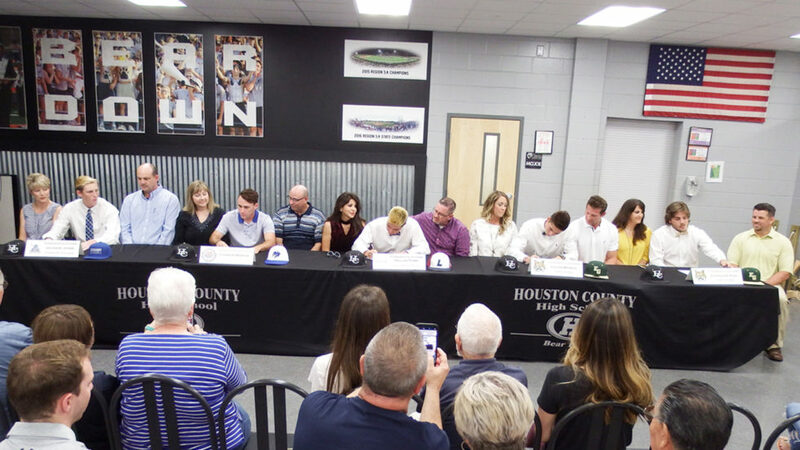 In what Head Coach Jason Brett said he believed was the biggest Bears’ baseball signing class – Brett himself will stepping down to take the assistant principal job – Jackson Jones, Connor Martin, Dillon Toms, Logan Morris and Chandler Ring all inked letters of intent. Jones is headed to Covenant College in North Georgia. Martin will be continuing his playing/education at Wilson College in Pennsylvania. 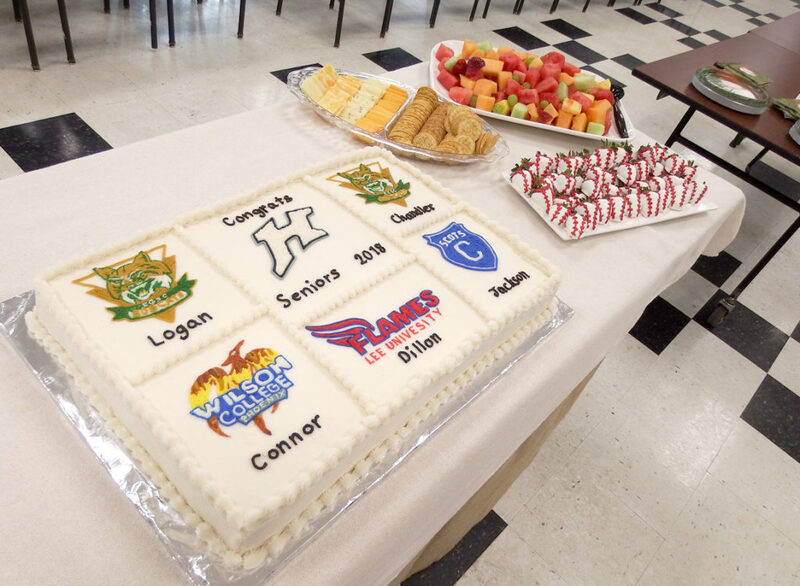 Toms is destined to be a Lee College Rebel in Texas and Morris and Ring will be teammates at East Georgia College. Jones is a four-year player. He performed dual roles, Brett said, at first base and pitcher. He finished the year hitting .268, with 11 runs batted in. He also had a 1.65 earned run average and was recipient of the Bears award. Martin hit .269 this past season – one in which Houston County finished 27-10 and made it to the Elite Eight before being eliminated by Pope, which went on to win the state championship. 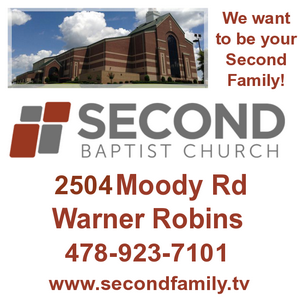 He had eight RBIs and was an Honorable Mention on the All-Region 1-AAAAAA team. 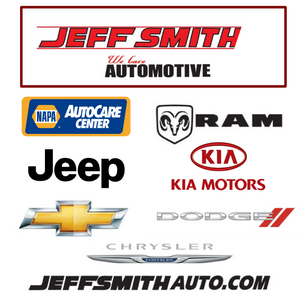 “His work ethic is second to none,” Brett said. “Connor is guy … (for example) we’re doing drills last year where you get five ground balls, move to next station and so forth. (And) he takes a ground ball and I think it ended up hitting him in the nose or ear. Regardless, there’s some blood and I’m like, ‘Get off the field Connor’ and he’s like, ‘No, I’m going to do it coach’ and kept on. Toms on the other hand, hit .253 with 14 RBIs. He was also an Honorable Mention for the All-Region 1-AAAAAA team. Brett said of this “coach on the field”: “In 2016 we won a state championship. And our catcher goes down. He starts cramping or his back starts hurting. And so Dillon is our backup, and we put him in. Proof of the latter came in the fact he hit .333 with two homeruns – “big” homeruns to boot, Brett said – drove in 27 and scored 32 times. He was also named All-Region 1-AAAAAA. Ring fit the same mold. Brett told of how the team was playing Columbus at state in 2016 and how, because the team had some pretty good arms that year, Ring hadn’t seen much playing time; he was also a sophomore at the time. Yet, the Bears got into extra innings and with the best bat at the plate, Brett believed, who gets the call? Evidence for him came in the fact he was 8-0 this past season. In fact, he beat Pope to force a game three. He finished with a 1.63 ERA, with 89 strikeouts in 60 innings. He also hit .337 with 21 RBIs and was named to the All-Region 1-AAAAAA team.